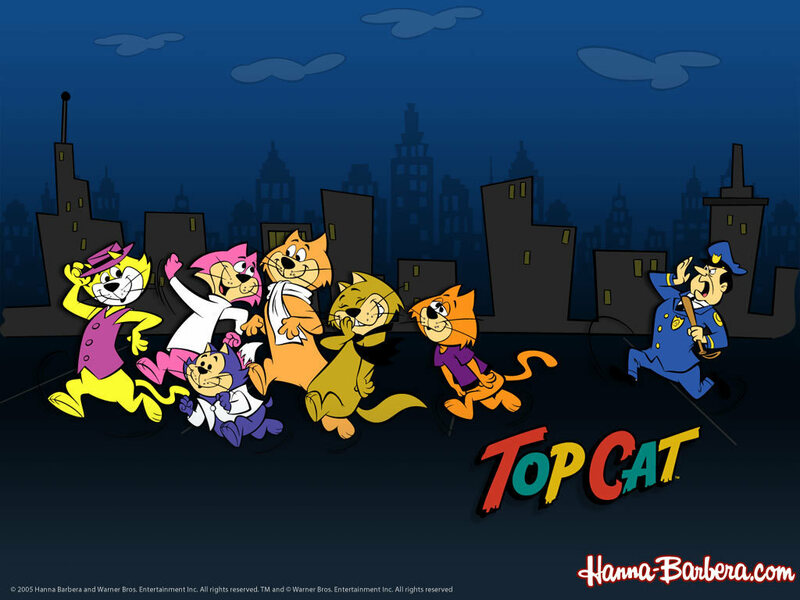 When I was a kid, I loved Top Cat. This was the lesser known of the primetime cartoons put out by Hanna-Barbera in the early sixties. The better known were the Flintstones and the Jetsons, which I also enjoyed, but I especially liked Top Cat. It seemed more hip. I liked cats, and I liked the voices and the urban milieu. I watched it in black and white, because we only had a black and white tv set throughout my entire childhood. Color sets were for rich people. I wanted to live in Top Cat’s world, free of parents, just living in a trash can in an alley, and having lots of cat friends. I liked the show so much that I formed a club, The Top Cat Club. I wrote it in big letters all over my notebook at school, which led to a lot of teasing. Nobody else seemed interested in the club but me. The show was based on street gangs of New York. Tom Cat was the leader, Benny the ball was the short blue cat that was TC’s sidekick. Choo Choo was my favorite. He was tall, pink, wore a turtleneck, talked like Woody Allen. He was the original inspiration for Lady Gaga I believe, in the episode Choo Choo goes Gaga Gaga. There was also the gang’s dummy, obviously named Brain, Fancy Fancy who was the ladies man with a voice like Cary Grant, and Spook, the beatnik in sunglasses. They were always having to contend with this very generic NY cop named Officer Dribble. I think I was taken in by the fact that cats had not been given this much characterization before. As I grew older, about ten or so, I formed a club with a girl, called The Man from UNCLE club. Obviously I had moved on from cartoons to the much more hip spy tv show. But I still recall the appeal of Top Cat. Seeing the episodes in color as an adult was an additional thrill. I had no idea that one cat was pink, another blue etc. Top Cat has never been given it’s due. This wasn’t the only cat cartoon I liked as a kid. I adored Gay Purree, a movie with Judy Garland, and Robert Goulet. It took place in France, which I liked. When I was a kid, France seemed very romantic and exotic. I identified with the main character, who I think was called Pierre. He was a yellow tabby farm cat, very good natured, and in love with the white Persian, Musette. Robert Goulet did his voice. He had a kitten sidekick, who was my favorite character. Of course, I was charmed by Judy Garland’s voice. She, of course, is Musette. Musette gets kidnapped by the evil Parisian sewer cats. The movie had a nice style about it, very early sixties in it’s approach. Which means it had a kind of hip, beatnik quality, toned down obviously for kids. But the look of the film is probably it’s best feature. I really liked the highly stylized black villain cats. The plot wasn’t riveting, but I liked it. It charmed me as a kid. I even had the comic book based on the movie. Much later the Aristocats came out. 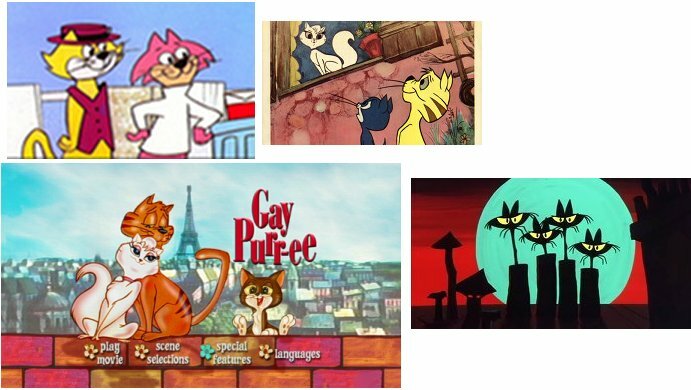 Gay Purree and Aristocats are the only mainstream cat cartoons I can think of. Aristocats has a certain charm as well, but my heart belongs to Gay Purree. I have a cat. I admit it. A lot of people can’t stand cats. I never really understood that. Now, granted, I have only one cat. I have no interest in having twenty or thirty cats. This post is for people who don’t understand cats, or people who like cats. I will try to give an idea of what it is like to have one, and why it is enjoyable. My cat, Buddy, is a tailless Manx/Siamese mix. He has been through a lot with me. He lived with me in a tiny room in a residential hotel. So we got to know each other pretty well. He joined me on an airplane, inside a carrier underneath the seat in front of me. Now, he lives in a studio apartment, so we aren’t literally on top of each other. Some people seem to think that cats just sleep, eat, and poop. Oh, and occasionally play. It is true that cats spend a lot of time sleeping. But I am a very important part of Buddy’s life. Basically cats relate to their owner as if they were an enormous cat, upon which they depend. I am supposed to understand his mews, and so it is quite frustrating when I don’t mew in response, or do any of the cat things that an enormous cat should do. But he tolerates it because what else can you do? Cats love to play silly games of hide and jump out, or just simple chases. They like physical interaction. Unlike what you may think, cats can be very affectionate. They love physical contact, and are content to be on your lap, or just lying next to you. They feel more secure, because they are snuggled up with their monstrous cat protector. The size difference also stimulates a cat memory of when they were kittens nursing their mother. When they were kittens they pushed their paws against their mother’s belly as they nursed. As adult cats they push their paws against their human owner’s belly. Again, this makes them feel secure. Cats often rub against their owner’s legs (although Buddy doesn’t do this), because they are leaving their scent so as to keep other cats away from you. If your cat feels safe, he will snuggle up close to you in bed. They are not aloof if they know you well and are bonded to you. My cat knows his name, and always comes when I call his name. He knows when he is being scolded, by my tone of voice. He puts his ears back a little, and may give a grumpy mew. Cats communicate with nips and bats of their paw. When they are annoyed or just excited, they will nip a little. A cat knows it can hurt you. Breaking your skin is not difficult with a bite or swat. But they don’t, unless they are very frightened, or extremely excited. Instead a cat will nip to signal you to not pet him there, or not pet him at all right then. You can teach cats not to nip or swat at all, but I don’t mind Buddy’s nips and swats. While it is true that cats are more independent than dogs, they can be very devoted to their owners. They don’t just climb on our laps for the warmth. They like us, in fact they depend on us. It is a strong bond. So many times I have felt inadequate when my cat mews at me, and all I can do is say “What?” and pet him, hold him, or offer him food. It’s a cat thing, and I don’t think Buddy realizes I’m not a cat.